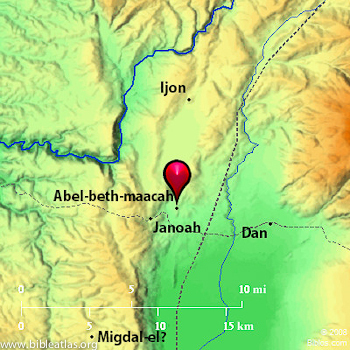 Abel Beth Maacah was a town at the very north end of the Huleh Valley—about 4 mi. [6.5 km.] west of Dan. During the reign of David, Joab pursued the rebel Sheba to the town and there the citizens beheaded him after "negotiations" between Joab and a "wise woman." (2 Samuel 20). It was along the route, coming from the northeast, through which the Arameans (Ben–Hadad; 1 Kings 15:20; 2 Chron 16:4 [Abel Maim]) and later the Assyrians invaded Israel (Tiglath–pileser III; 2 Kings 15:29). Abel Beth Maacah has been identified with Abil el–Qamh/T. Avel Bet Maakha (204296). It is located along one of the major sources of the Jordan River in an area that receives over 25 in. [63 cm.] of rain each year. The site in currently (June/July 2013) being excavated. Their blog can be found here and the ABM Facbook page here.